Etsy and Storenvy Shops Opended! RuRu Victoria has a special preorder for this Love Baby Alpaca! I wanted to use this yarn to make a Golden Retriever puppy, I thought the color will be close to the real Golden Retriever 🙂 This was my first time to try to dye my yarns. Using Compulsion to dye..however I felt that it was not successful :S Why? Because all the fur shrunk after I dye…and it was not fluffy at all when it is finally dried. 🙁 I saw other pro ami masters dye their own yarns and all their yarns looked fluffy and furry. :S I don’t know what went wrong in the process *sigh* I guess I have to dye more in order to find out. You can order your very own lovely Amigurumi collectible dolls 🙂 I also do special fund raising items for your event, just let me know what you need and we can start from there. All my ami dolls are using the best quality materials and every doll is unique and special. 🙂 15+ hours to make each doll come to live.. Tried to make somewhat contrast with her light orange fur, Momo is a cutie to treasure! She got a lace band on her head made her even more romantic type, haha. I’ll try to make a small prop for her to stand on, also make a little pet for her so she won’t be that lonely :S What should I make, teddy bear or little puppy? 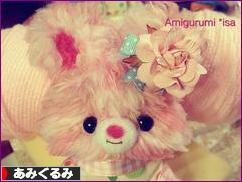 😀 Well, I’d like to see Momo hugging her little teddy bear….SO I might make one just for her. >_< Wait! This might be the first time ever I’m using felt to make something other than mushroom! I still need to rearrange his face and fur to make him look better! Used similar color to make his nose…I love this orange color! 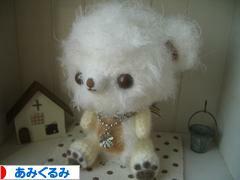 ^^ His fur is made with super soft yarns, you can’t stop kissing and holding him because he is super cuddly and soft! ^^ OH, did I mention he’s about 5 inches tall ONLY? 😀 He So tiny, I think I can take him everywhere I go. Just finished my Amigurumi bear no4, cute bear! I’m SO happy that I finished this. So far, this is the cutest bear that I ever crochet! ^^ Don’t you think he’s the cutest little tiny bear? 1. Disney Character Arupakasso Dream!